Sherab Gyaltsen Rinpoche, a highly respected lama of the Kagyu lineage, is a “Maniwa’, a title given to masters of the Loving Eyes (Skt. Avalokiteshvara; Tib. Chenrezig) practice who have accomplished at least a billion OM MANI PEME HUNG mantras. Rinpoche was ordained in Rumtek monastery by the 16th Karmapa. An exceptionally gifted student, he mastered all aspects of traditional Buddhist study, from the sutras and tantras to rituals and music to the sciences, art and composition. Among his many activities, Rinpoche is a retreat master of the three-year retreat center in Pharping, he has built and oversees a monastery of a hundred nuns west of Kathmandu, and plans to build a monks’ monastery east of the capital are moving along. Several times a year Rinpoche leads thousands of practitioners in the practices of Nyungne (fasting meditation) and Loving Eyes at his Nyeshang monastery in Swayambhunath. Over fifteen billion mantras have been accumulated over the years. Rinpoche’s teaching style is deep, direct and accessible. His teachings, peppered with practical advice, stories and warm humour, leave a lasting impression on all fortunate enough to hear them. 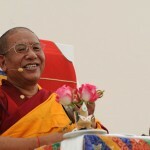 Rinpoche first gave teachings the UK in 2009: click here for event report.